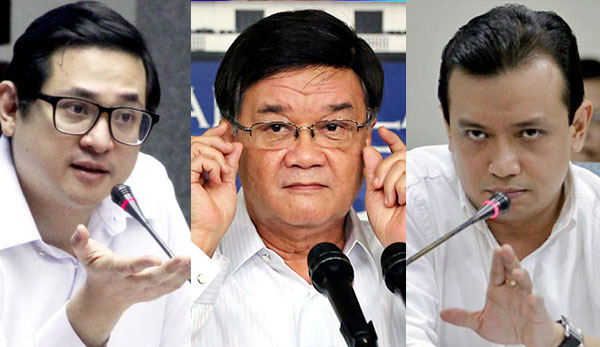 Justice Secretary Vitaliano Aguirre II linked Senators Antonio Trillanes IV and Bam Aquino in the on going crisis in Marawi City. Aguirre claims that the two senators met with Alonto and Lucman clans in Marawi weeks before the crisis started. Aside from Trillanes, Aquino — Aguire also linked Magdalo party-list representative Gary Alejano and Ronald Llamas. Vitaliano Aguirre said he has proof/photo of the meeting that will prove their involvement in Marawi siege. Meanwhile, the Philippine Marines has recovered ₱52M cash and ₱27M worth of cheques from an abandoned post of Maute group in Marawi City on Tuesday. The money is believed to the funds from international terrorist group. What can you say about thus accusation of Aguirre to Trillanes and Aquino? Share your thoughts below.